Detox tea will allow your digestive system to take a rest and assist with digestion, metabolism, detoxifying, elimination and cleansing of toxins from within the body. 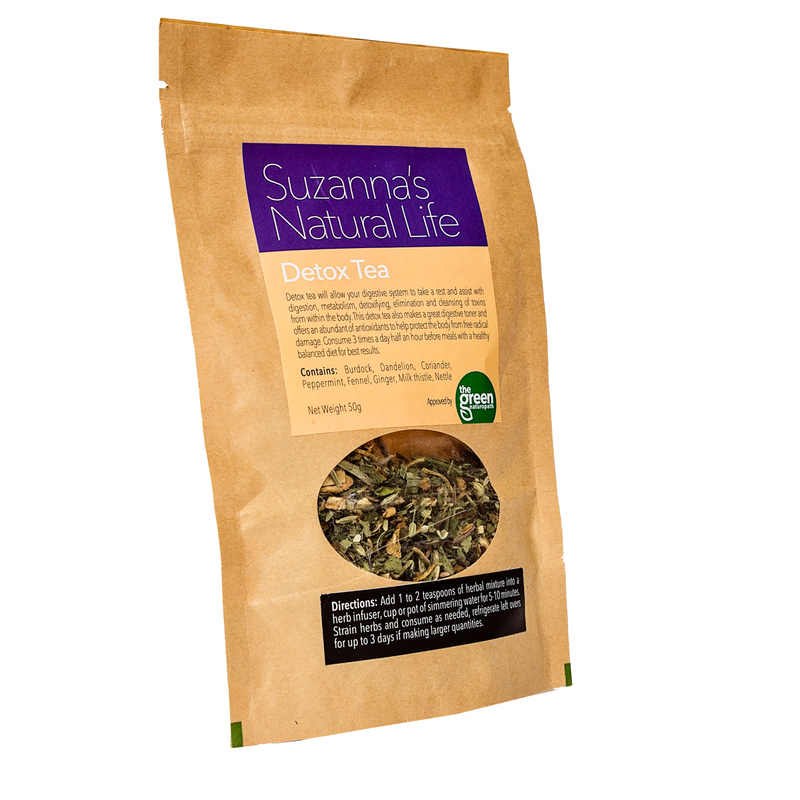 This detox tea also makes a great digestive toner and offers an abundant of antioxidants to help protect the body from free radical damage. Consume 3 times a day half an hour before meals with a healthy balanced diet for best results. Burdock*, Roasted dandelion root*, Coriander seeds*, Peppermint*, Fennel*, Ginger*, Milk thistle*, Nettle*. Burdock is a depurative and great for purifying the blood and assisting the body with eliminating waste. Dandelion is a bitter that assists in restoring and protecting the liver and kidney, while assisting in bringing back tone and energy to the digestive system. Peppermint and fennel were chosen in this tea to assist with calming and toning digestive weaknesses. Ginger warming to the digestive system was chosen to assist with circulation and with the removal of wastes from in the body. Milk thistle is protective on the liver and high in antioxidants to protect the body from free radical damage. Nettle was chosen to help in cleaning the urinary system assisting in the removal of wastes within the body while also replenishing the body with its rich source of nutrients. Herbal teas are to assist in maintaining health and do not claim to cure any acute or chronic health issues. Check with your health practitioner to work through health issues that require practitioner assistance. Be sure to check if this herbal tea is suitable for you if you are pregnant or trying to fall pregnant, on medication and / or dealing with complex health issues.